Donna Bell, is a 49 year old native of Louisiana who on June 28th 1979 was in a tragic car accident leaving her a C-3 C-4 quadriplegic. Donna was only 15 at the time of the wreck which broke her neck leaving her unable to move from the shoulders down for the past 34 years. To make a tax-deductible donation to this fundraising campaign, click on the Donate Now button. Donna has never had a power wheelchair, nor a Custom Handicapped Van with a lift, required to transport a heavy chair like that in the 34 years since her accident. For 34 years, her family has had to lift her in and out of standard vehicles. What now for Donna? In time with the spreading of her story and helping to raise awareness of not only her disability but many others, she will be in a new custom van and power wheelchair that will help her and her family tremendously. To help with the cost of these and other uninsured medical expenses, a fundraising campaign in Donna’s honor has been established with HelpHOPELive, a nonprofit organization that has been assisting the transplant community for 30 years. In 2000, they expanded their mission to include those who have sustained a catastrophic injury. All contributions are tax-deductible, are held by HelpHOPELive in the Southeast Spinal Cord Injury Fund, and are administered by HelpHOPELive for injury-related expenses only. Please consider helping Donna realize this dream and improving her quality of life by joining our “Freedom For Donna” cause and contributing to her HelpHOPELive fundraising campaign? Your donation is greatly appreciated. Donna has chosen to fundraise with HelpHOPELive in part because HelpHOPELive assures fiscal accountability of funds raised and tax deductibility for donors. Donors can be sure that funds donated will be used only to pay or reimburse medically-related expenses. To make a tax-deductible donation to this fundraising campaign, click on the Donate Now button. FreedomForDonna Finds a New Home! 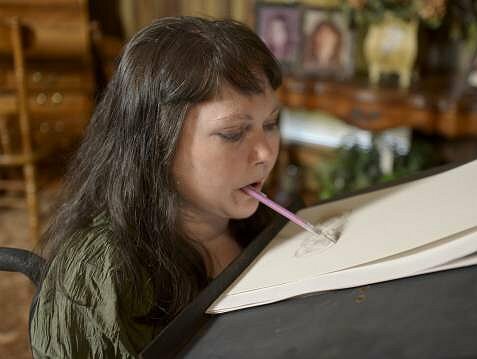 Many of you know the story of my friend Donna Bell, the quadriplegic artist with the simple dream of being able to visit New Orleans in her lifetime. This trip and the even more humble goal of being able to do anything outside of her home depends upon Donna getting a good handicapped-accessible van. We are proud to announce that, as of January 2014, the good people at HelpHOPELive have agreed to help Donna organize this fundraising effort with the goal of raising enough funds to purchase the van. Please make note of our new home: www.FreedomForDonna.org. Come visit today, learn more about Donna’s dream and help us get the numbers needed to make that dream a reality. About our new partner: HelpHOPELive helps victims of catastrophic events, and their families, to overcome financial barriers on the road back to a better life. Among other services, they provide guidance on the fundraising process and a web page. Funds raised are held in the Southeast Spinal Cord Injury Fund and are disbursed for injury related expenses. I wish you all the best Donna! !